As a Certified Yoga Instructor since 1990, I offer group and private yoga sessions geared toward personal enrichment. I incorporate an eclectic yoga style instruction which includes mindfulness training, yoga philosophy, and yoga nidra. The benefits of yoga are expansive as one learns to unite the connection of body, mind and spirit through a variety of asana’s (postures) focused breathwork and mindfulness techniques. Each class or private session is therapeutic in nature and is just right for beginners, mid-level and experts at yoga. All are welcome! * Private Yoga Session: This is a one on one session specifically designed for a client's needs. This therapy is tailored to the special needs of the client. 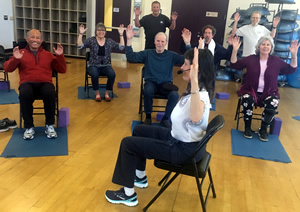 It can include strength training, balance work, dance therapy, dog therapy, aromatherapy, massage, and flexibility training, and a variety of other modalities as needed. * Retreats: BEYOND YOGA is designed to meet your needs for greater self-discovery and personal expansion through a flowing and strengthening sound yoga practice, guided Meditation, Yoga Nidra, and Spiritual expansion through affirmations. Organized retreats to locations such as Yelapa Mexico, Napa Valley, Land of Medicine Buddha, Yosemite and other locations around the Monterey Peninsula such as Garland Park, Carmel Beach and other majestic locations. 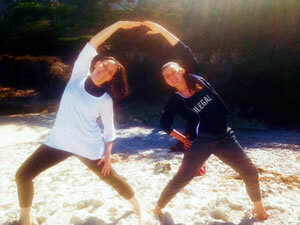 Pictured at right: Christine and Kaylan during a private Yoga session on Carmel Beach. 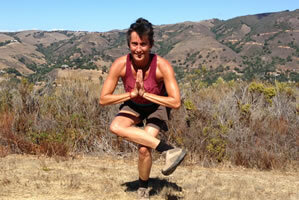 Carmel Yoga Center (Level 2) - 9:30am to 11am. There's a joyfulness in Gina's yoga class connecting us to our mind, body, spirit and friends. It's as necessary to me as food and sleep. " D.W.